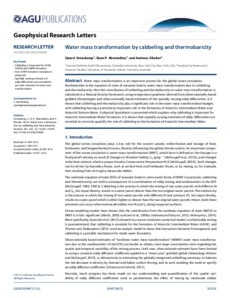 Water mass transformation is an important process for the global ocean circulation. Nonlinearities in the equation of state of seawater lead to water mass transformation due to cabbeling and thermobaricity. Here the contribution of cabbeling and thermobaricity to water mass transformation is calculated in a Neutral Density framework, using temperature gradients derived from observationally based gridded climatologies and observationally based estimates of the spatially varying eddy diffusivities. It is shown that cabbeling and thermobaricity play a significant role in the water mass transformation budget, with cabbeling having a particularly important role in the formation of Antarctic Intermediate Water and Antarctic Bottom Water. A physical hypothesis is presented which explains why cabbeling is important for Antarctic Intermediate Water formation. It is shown that spatially varying estimates of eddy diffusivities are essential to correctly quantify the role of cabbeling to the formation of Antarctic Intermediate Water.